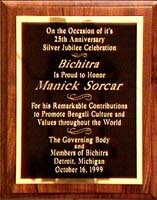 On October 16, 1999, Manick Sorcar was honored "For his Remarkable Contributions to Promote Bengali Culture and Values Throughout the World", by BICHITRA, Detroit, Michigan, at their 25th Anniversary, Silver Jubilee Celebration. Sorcar was invited by the committee to be their guest during the three day celebration with cultural programs participated by local and professional artists from India. The honor was mainly to recognize and appreciate Manick's significant contribution to the children's world through his animation features, all of which are based on Indian classic fairy tales. (link to detail pages) Prior to the recognition, his "Gandhabichar", the coveted C.I.N.E. Golden Eagle winning animation based on Sukumar Ray's classic nonsense poem, was screened on the stage. Amidst thundering applause, a special plaque was handed to him by Bichitra's president Mr. Partha De.